Little man decided to bring his Peppa magazine into Mummy’s bed whilst I was waking up properly (takes forever these days! ), proceeding to snuggle himself under the duvet and read look at the pictures. Playing with his new wooden peg & hammer toy which Nanna bought him on a shopping trip yesterday – we love wooden toys. 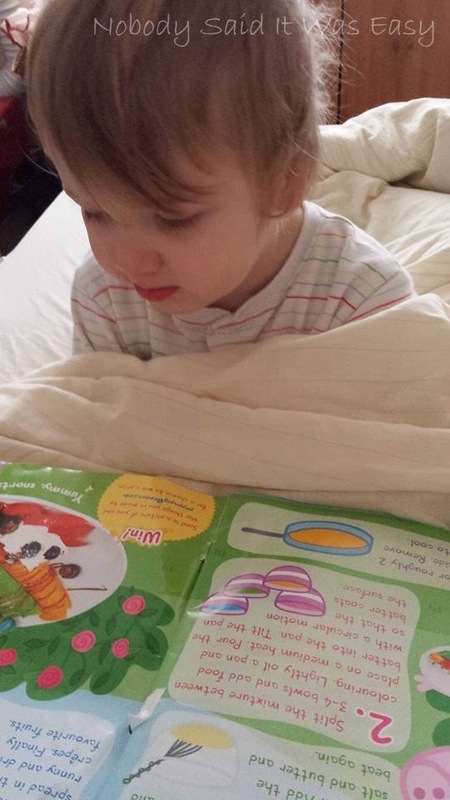 Whenever he sees candles in a book or on TV, he tries to blow them out – too cute! Snuggle time with Mummy after nursery – I was on my ball and he wanted to join me! Love his hand on my tummy, like he’s protecting his little sibling. Well don’t you know that the best place to watch TV, is from a tunnel? Little man is sporting a fat lip today. He had a little accident last night before bed – he was charging about like he usually does when tired to try and keep himself awake, proceeding to run into Daddy and trip over his feet, resulting in his teeth going through his lip and blood on a cream carpet! Haven’t really got around to taking any other photos today, so this is my snack of pork pie and gherkins, after a Twitter chat this week about pregnancy cravings! Big fan of wooden toys in this house as well! The last photo both horrified and pleased me.. Love pork pie but gherkins.. Argghhhh! I want gherkins now and I'm not even pregnant! Lol, I now want a burger with gherkins! It really is, always makes me chuckle! The photo of him blowing out the candles in the book is just too cute 🙂 And, I'm loving the gherkins, yum! Love those wooden peg toys.Keep meaning to get one for my little one. This one was from Home Bargains so cheap as chips! We love wooden toys too. We have bitten our tongue before and it was not pleasant! Very sweet seeing him touching the bump. Love that protective hand, how wonderful! Lovely pictures – the protective hand is just gorgeous, and blowing the candles out on the book is too cute!